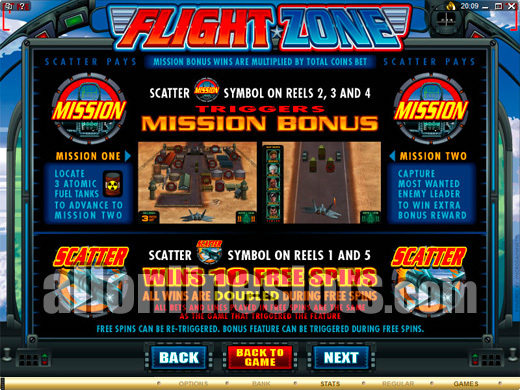 Flight Zone is a 25 line slot from Microgaming with a Top Gun theme. It has a 1,000 coin jackpoty on teh base game and two bonus feautures. Win free spins with all wins doubled or the Mission Bonus where you pick targets to win prizes. 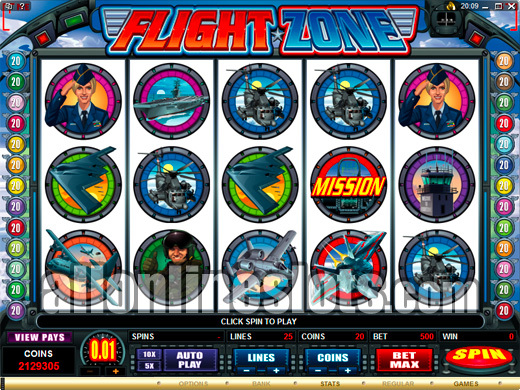 The Flight Zone slot from Microgaming is pretty clearly based on the Top Gun film. It has Top Gun style graphics and the music is very similar to the theme song of the hit film. 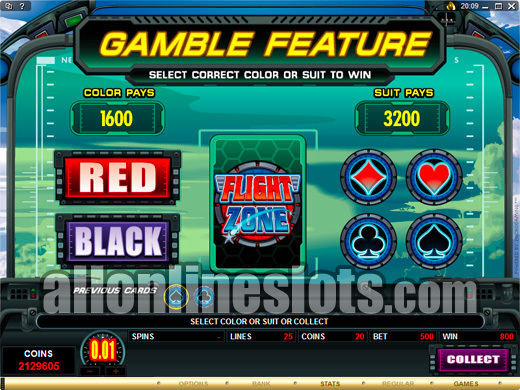 The game uses Microgaming's 25 line format and has two bonus games where you always win additional cash. The Flight Zone logos are wild and appear stacked on the 2nd, 3rd and 4th reels only. While you cannot get five wilds the fact that they are stacked means you can get some huge multi line wins on a single spin. For example if you get stacked wilds on all of the middle reels you win on all 25 lines. 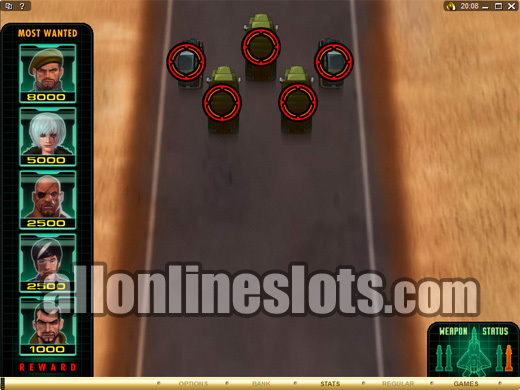 The pilot symbol offers the top line win which is 1000 coins. This might seem small but you have to keep in mind that with the stacked wilds you can get the jackpot on more than one line at a time. Second highest line win is 500 coins for five jets and third highest is 200 coins for five women or stealth bombers. The scattered missile symbol appears on the first and last reels only. Get both on the screen at the same time and you win 10 free spins with all wins doubled. 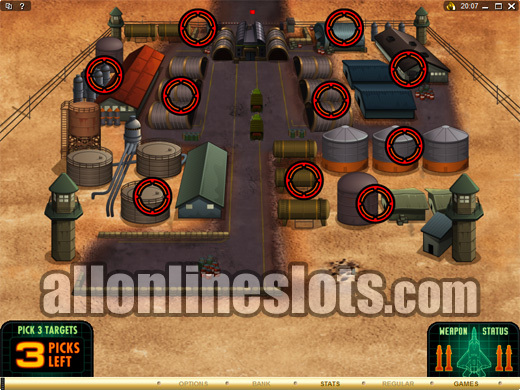 The free spins can be re-triggered and the second mission bonus can be won during the free games. To win the mission bonus you need to get a Mission scatter symbol on the middle three reels. Once activated you move to a second screen stage where you have a range of targets on the screen. You get to pick three targets and then you fly over and destroy your targets (View Screenshot). When you destroy your targets you can get additional wins if other targets are destroyed. If you uncover thee or more of the atomic fuel tanks you move on to the second stage of the bonus. Here you follow five trucks which are escaping the scene (Screenshot). You get to pick as many targets as you have rockets. Wins here range from 8000 to 500 coins. The Top Gun film is a bit of a cult classic so it is fairly certain that Flight Zone will be a hit with a lot of players. The stacked wilds make for big winning chances and the bonus game really adds to the game. Even if you didn't like the film the game is worth checking out.